Oulton Park - I Say Ding Dong Shop - Buy Stickers, Decals & Unique Automobilia. 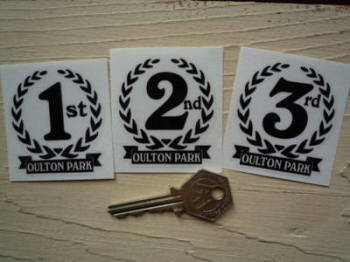 Oulton Park 1st, 2nd & 3rd Podium Garland Stickers. 2". Oulton Park Circuit 70's Suzuki RG50 Motorbike Sticker. 3". Oulton Park Gold Cup 50th Anniversary Sticker. 2". Oulton Park Green Shield Classic 50's 60's Style Sticker. 3". Oulton Park RAC A49 Sticker. 6" or 12".